Ready or not, the holidays are here! I want to wish you the happiest of holidays – no matter what or how you celebrate. In our house we celebrate Christmas, and that means lots of cookies and sweet treats. Shamefully I am behind on my Christmas cookie baking this year. This week I am going to have a cookie baking marathon to get caught up, but for now I have only one kind of cookie ready to go. 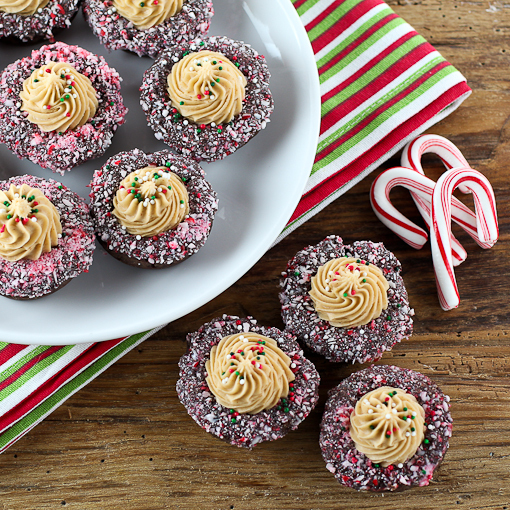 These little cookies were born out of my love of coffee drinks of the peppermint mocha variety. With coffee, mint, chocolate, and brown butter these cookies deliver a lot of flavor in a pretty little package. The cream cheese chocolate cookie cup, that serves as the transport mechanism for all the other goodness, is a only lightly sweetened. 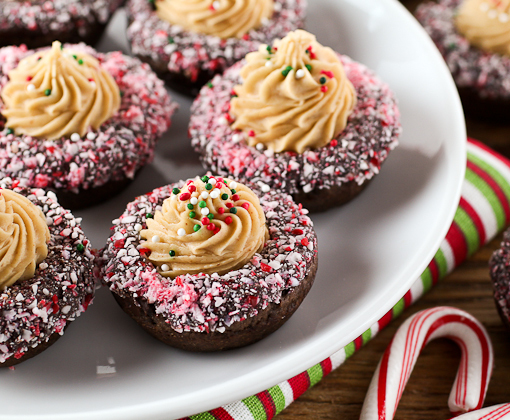 I made them slightly bitter on purpose – they are loaded with buttercream and coated in chocolate and crushed peppermint. All these elements are quite sweet and I felt that if the cookie was also sweet the finished product would make your teeth ache. I like balance and the slightly bitter cookie cup is the right foil for the sugary embellishments, but if you want the cookie base sweeter feel free to add more sugar. By far my favorite part of these cookies is the buttercream filling. It is a concoction of browned butter, espresso, a pinch of salt, and rich half and half. 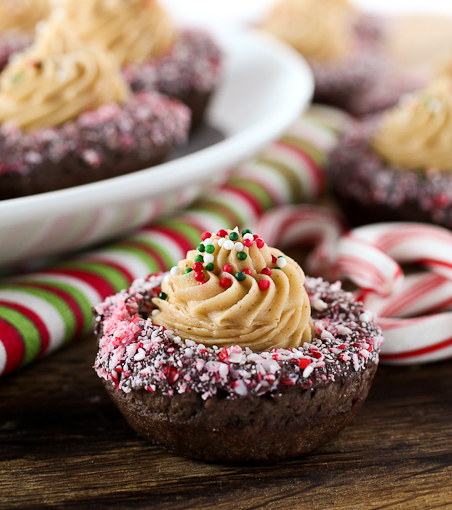 This recipe make slightly more frosting than you need, but the leftovers would be lovely slathered over cinnamon rolls on Christmas morning. Just saying. 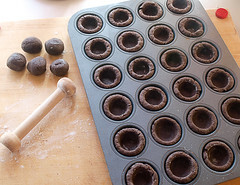 Begin by making the cookie cups. 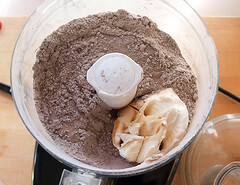 In the work bowl of a food processor combine the flour, cocoa powder, cornstarch, brown sugar, and salt. Pulse 5 times to combine. 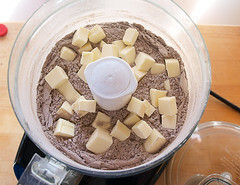 Add the cubed butter and pulse until the mixture looks like coarse sand, about 12 times pulses. 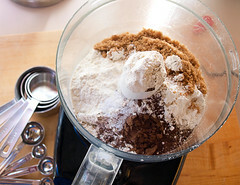 Add the cream cheese, milk, and vanilla and pulse until the dough forms a smooth ball, about 15 pulses. 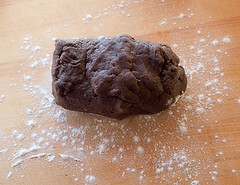 Turn the dough out onto a lightly floured surface and divide into 30 pieces. 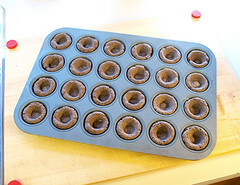 Roll each piece into a ball and place them into a non-stick mini-muffin pan. Using a dough tamper, or your fingers, press each ball into a cup shape. Cover with plastic and chill for one hour. 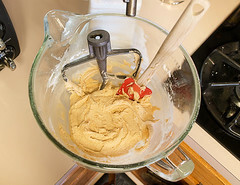 Heat the oven to 350 F. Once the dough has chilled remove the plastic and bake for 13 to 16 minutes, or until the cookies are firm when pressed. Cool for 5 minutes in the pan, then transfer to a wire rack to cool to room temperature. 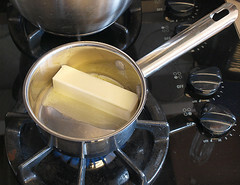 In a medium pot over medium heat add the butter. Cook, stirring constantly, until the butter browns and smells nutty. Cool the butter completely to room temperature. 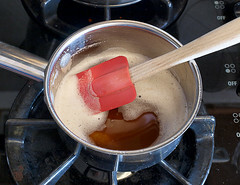 Once the butter has cooled add it into the work bowl of a stand mixer fitted with the paddle attachment (or in a medium bowl with a hand mixer) along with 3 cups of the powdered sugar, espresso, milk, vanilla, and a pinch of salt. Mix on low speed until the mixture is smooth. Add more powdered sugar one tablespoon at a time until the mixture is medium stiffness - meaning it holds a peak when you remove the paddle. To assemble the cookies begin by melting the chocolate chips. Place them in a shallow microwave safe bowl. Heat the chips for 30 seconds then stir. If the chips are not melted (and at this point they will not be) return them to the microwave for 12 second intervals until they are melted and smooth. 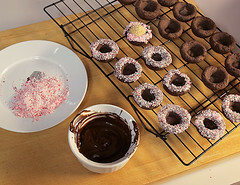 Dip the top edge of the cookie cups into the melted chocolate, letting any excess drip off, then directly into the crushed peppermint. 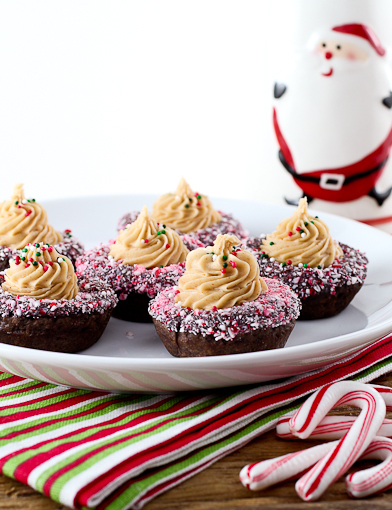 Pipe, or spoon, the buttercream into the cups and top with colored sprinkles. Chill for 30 minutes to set the chocolate before serving. © 2012 – 2015, Evil Shenanigans. All rights reserved.